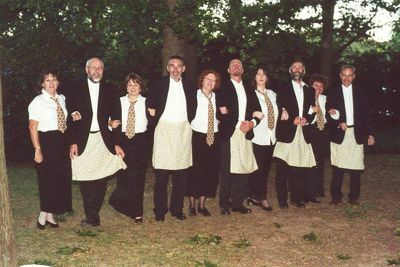 The Shiny Bum Singers were created for the 1999 Australian National Folk Festival, held annually in Australia’s government capital, Canberra. Noting that the local industry (public service) was never mentioned, Chris Clarke, Pat Ryan and Julie Barnes who had been at a Danny Spooner singing workshop at the 1998 National Folk Festival decided to lodge an application for the ‘Shiny Bum Singers’ to perform ‘the work songs of the public service in traditional working dress’ – neither the group nor the repertoire yet existing... Their comfortable belief that their ‘ridiculous‘ application would be rejected soon disappeared when they were informed that they were on the program for 1999. What to do? It was eight weeks out from the Festival. They had a few songs for a demo tape, from some informal workshops hosted by Chris Clarke and David Walker with some writers known in Canberra literary circles, but who had barely written a song between them. A quick ring around found the original group of twelve, including four of the song writers, who had never sung in public either. Seven weeks of frantic rehearsals readied them for their first performance. They thought that they would be singing their humorous parodies for a few friends and relatives, hopefully an audience at least as large as the group. Instead, the smallish venue was packed to the rafters and hundreds were turned away. Some headline performers present lobbied Festival organisers to allow an unscheduled repeat later that day. As word had spread, a second packed audience included a Who’s Who of folk voices, and The ‘Shiny Bums’ were on their way. They performed for packed houses at several subsequent ‘Nationals’ and have cemented their place in the hearts of both the folk fraternity and the wider population of Canberra and surrounding regions. The group were soon invited to perform at Public Service happy hours of many government departments, conventions and a host of other functions, as they developed and experimented with an endless supply of new material from their talented team of writers. Their first gig out of Canberra was the Majors Creek Music Festival in November 1999, again to packed venues and enthusiastic audiences. The Bums went on to perform at several Majors Creek Festivals, and at the 2002 festival facilitated their first Parody Writing workshop, at which the participants, with some prompting from the Bums, put together an original parody (if that is possible). In December 2000 the group performed for a Christmas ‘Bash’ at the ‘Loaded Dog’, a well respected folk venue in Sydney, boasting probably the best acoustics in the city. Again the response to the group was fantastic. Needless to say the ‘Bums’ returned for several further years. In 2001, the Bums made a more mainstream appearance in Australia’s Centenary of Federation celebrations in Canberra, including the Shortis and Simpson production Candid Canberra, an historical piece about the Capital’s origins as a government city, with musical direction by John Shortis and staging by Moya Simpson, who have remained the Bums’ professional mentors. Strict disciplined rehearsals were a shock, not in their corporate plan! It was a big production show including about two hundred other singers and dancers. The Bums were also involved in the annual ’rhAPSody’ concerts, named as a gathering of local Australian Public Service (‘APS’) choirs. Initially, the group’s humorous repertoire provided the comic relief for the event, but soon other choirs also introduced fun numbers. One of the Bums parodies was always sung by the massed choirs in the rhAPSody finale. In September 2001, the group travelled further afield to the Jamberoo Folk Festival. The Bums presence at the 2002 National Folk Festival was in Blue the Shearer’s musical Celestial Blues, a hilarious journey into the formation of the universe from the Black Hole. With Blue the Shearer as anchor, the cast sang and danced through the sometimes, sordid lives of the celestial inhabitants of the universe. The script was put to music by David De Santi and the Shiny Bum Singers. In 2001, the group also dipped its collective toes into the world of television, with a brief spot on the new ABC Australia-wide documentary, Radio Pictures. The Bums also took part in a rally to Save the ABC, singing to 10,000 happy souls. The ABC still exists as a direct result of this performance, so some may not thank us for that! In the blur of more recent years, the group have been further afield, from the last Australian Folk Gathering at Albion Park with another a productive and robust Parody Writing workshop, to the Illawarra Folk club, Umina Beach Festival,, Bulli and Kangaroo Valley to the north, and south to Cobargo, and even ‘down Mexico way’ (Australian in-joke about crossing the New South Wales border into Victoria) to Corryong, and even outlier visits by some members to the Top Half Folk Festival near Darwin, most recently in 2012 for a concert in memory of the late and widely known and loved Shiny Bum and poet David Meyers. 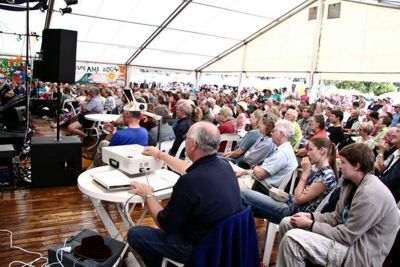 Further appearances at National Folk Festivals in Canberra, have extended the audiences of the early years to children (about that mysterious workplace their parents go to during the week – with us! ), to Home Brew Workshops, political cabaret, and ‘Be A Bum’ join-in workshops, and in the performer competitions for the craziest versions of ABBA, Queen, Rocky Horror Show etc., in which they got to the big-stage final doing their political satire version of the “Timewarp” in 2011. Convinced of the global relevance of their work, they also took the valuable learnings of the Australian Public Service to that bastion of bureaucracy the UK in 2007, where audiences from the National School of Government to Surrey County Council, and at folk venues from Cornwall to Kent discovered that the issues obliging us to laugh at and with our bureaucrats or go mad, are universal. The now infamous parody of Morris Dancing - the 10 Meg Morris, went down well at Rochester, a Mecca for Morris at their annual Sweeps festival. The Shiny Bums have also appeared in recent years in the annual Smart Arses, Bums And Short Arses political cabaret with Shortis and Simpson, and the ‘House Howlers’ parodists from the Parliament Press Gallery. There seems to have been an endless stream of parody writers coursing through the group since their initial performance, to the point that there are always far more parodies written than can ever be rehearsed or performed in a repertoire of over 200 songs. Since their inception in 1999, the Shiny Bum Singers had produced five song books entitled The Tiny Shiny Bum Songbook, It’s Been a Long Year, They'll Go Ape at Our Procedures, Have You Been Told Lately and If We Could Talk to the Bureaucrats all of which sold extremely well, especially in folk circles. They then consolidated them with later songs and the full background story into ‘The OmniBum’ sub-titled ‘Everything We Ever Sang, And Why’, published by Boris Books in 2009, and obtainable from Boris Books. Needless to say, the flow of new songs has not stopped since, nor the story, which now includes the sensational mangled musical ”Rodgering Hammerstein”, an’ operetta-romp through our parodies from musicals - though of any composer - which achieved a kind of standing ovation as the audience at the 2011 ‘National’ rose in a body for the finale Public Service Anthem (to ‘Anthem’ from Chess), and stayed up. However, although the story has run on, an OmniBum sequel ‘The CompendiBum’ is as yet only a gleam in the eye. 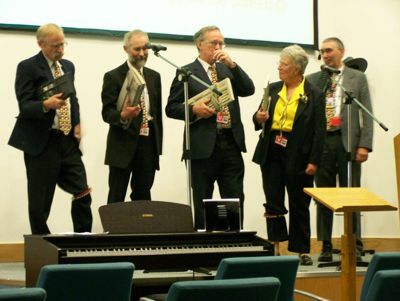 Assiduously recorded live performances over the early years were also trawled through for the Bums’ first CD in 2006 - ‘An Audience With The Shiny Bum Singers’, selected to highlight the audience response. This is virtually sold out and has not yet been re-issued or superseded, although the Bums have started some studio sessions, so watch this space. 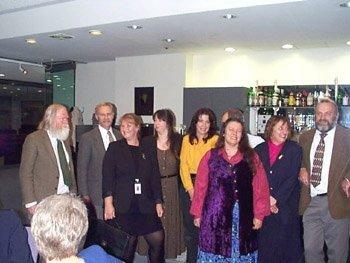 The Shiny Bum Singers have also been regular visitors to the studios of ABC Radio, and several local community radio stations in Canberra, and have gone to air on national programs on several occasions, including even brief appearances on ABC TV. From a dream debut, the Shiny Bum Singers have continued to develop their flair for humour, fun, entertainment and audience participation, which ensures them a return invitation to any venue. And the surprise is long gone that people turn out to see us!